Brooklyn, NY - A freshman city councilman who found himself at the center of a social media firestorm is about to become the focus of a protest rally over his remarks about Palestine. City Councilman Kalman Yeger created the hullabaloo on Wednesday with a tweet saying “Palestine does not exist. There, I said it again. Also, Congresswoman Omar is an anti-Semite. Said that too.” Yeger, who was taken to task last year for similar remarks in a Bklyner article (http://bit.ly/2TLSaKs) by journalist Zainab Iqbal, finished his tweet by thanking Iqbal for following him on Twitter. 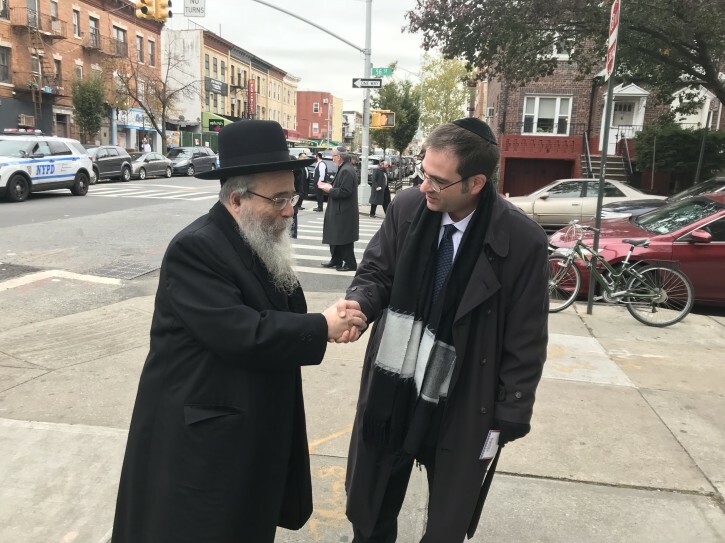 A rally to protest Yeger’s remarks is called for 6 PM this evening at the councilman’s office at 4424 16th Ave in the heart of Borough Park. Among those supporting the protest are Bay Ridge for Social Justice, Jewish Voice for Peace, Black Lives Matter Brooklyn, South Brooklyn Democratic Socialists of America, NYC Democratic Socialists of America, New York Progressive Action Network, Union of Arab Women and Yalla Brooklyn. Former Assemblyman Dov Hikind took to Twitter to announce another gathering scheduled 15 minutes earlier at the same location saying, “COME OUT TO COUNTER-PROTEST AGAINST ANTISEMITE LINDA SARSOUR WHO’S TRYING TO CHARACTER-ASSASSINATE COUNCILMAN KALMAN YEGER.” A second tweet by Hikind said that he had spoken with Yeger who said that he had been receiving death threats. Yeger did not respond to multiple requests for comment from VIN News. Speaking at a press conference today, City Council Speaker Corey Johnson called for Yeger to be removed from the council’s immigration committee, reported AM New York (http://bit.ly/2TF9GzY). “My personal viewpoint is those comments make me uncomfortable with having someone with those viewpoints on a committee that’s supposed to work with immigrants,” said Johnson. He should apologize when Mullah Omar from Somalia apologizes. The fact is there has been no "Palestine" since the end of the British mandate in 1948 and there was never a Palestinian people or nation. Can anyone provide information on a Palestinian government prior to the British mandate? He is absolutely right on target .All jews born in the mandate time also had passports with that title palestine .and there were a sizable amount of them. Even though that word was not liked by the zionists it should have been incorporated somehow . Hey! Welcome back to using your screename again. Feel safe enough already?! Let’s hear what you have to say about the mueller report. Remind us again... when are the impeachment proceedings starting? We are in golus and this guy mouths off for no good reason. Hikind is known for doing what Yeger did now. Yeger on the other hand is a naive childish person who has no clue what he did. It’s sad when self haters side with the enemy. Feh. Perhaps this is more fun & interesting for him than doing the work he was elected to do. A disgraceful chilul Hashem by our own people. How in the world can a Yid throw such an abhorrent comment and not think of klal yisroel? How provocative and self hating can you be?! Shldnt a Yid know bounds and not meddle into unsafe territory?? This is not ur line Mr councilman. You were elected to do ur job not to throw us under the gutter. RETRACT YOUR DISGUSTING COMMENT! Its not too late. As a councilman in the city of New York, Yeger represents all New Yorkers in his district. He represents New Yorkers who are Arab, as well as those who are Jews. Congresswoman Omar is as antisemite, but lumping that comment together with remarks targeted againts constituents he represents shows arrogance, lack of awareness that we are in galus, gross insensitivity to Arab constituents and is inflammatory and plain wrong. He is bigoted and increasing hate for constituants of all religions, including Jew, Arab and Christians. The truth of his comments is not the point. Sone true things are better left unsaid. I agree with #2 & #6. Yeger’s comments only serve to increase anti- semitism. “ A disgraceful chilul Hashem by our own people. How in the world can a Yid throw such an abhorrent comment and not think of klal yisroel? How provocative and self hating can you be?! Shldnt a Yid know bounds and not meddle into unsafe territory?? Leave NK out of the pic now. First time in my life they demonstrated normally unlike their crazy ways. And now use the word scum to target someone else. Or throw it at urself rather. NK and their supporters are evil scum.